· More than 31,000 millennials from over 180 countries have participated in the Global Shapers Annual Survey 2017 on technology, economy, values, career and governance. · Climate change is keeping millennials up at night: it remains their biggest global concern for the third year in a row. 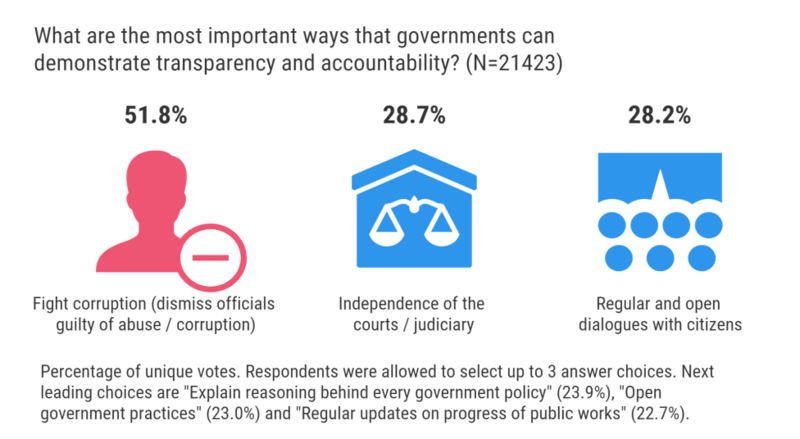 · Corruption, inequality and a lack of career and economic opportunities are seen as the most pressing national issues by millennials around the globe. · Optimism beats pessimism: technology is creating more jobs than it is destroying, say 79%. However, only 26% would trust a robot to make decisions on their behalf. · The United States (18%), Canada (12%) and the UK (10%) are the top destinations of young people looking to advance their career. · Over 78% young people would welcome refugees in their own neighbourhood. Geneva, Switzerland 28 August 2017 – The World Economic Forum today launched the third edition of the world’s most geographically diverse survey of millennials, the Global Shapers Annual Survey 2017. Over 31,000 people aged between 18 and 35 responded, giving insights into their views on society, business, politics, the economy and technology as well as their workplace and career aspirations. The survey, which was available in 14 languages, surveyed young people from 186 countries and territories. Young people selected Climate Change and the Destruction of Nature as the most serious global issue. This is the top global issue for the third year in a row. 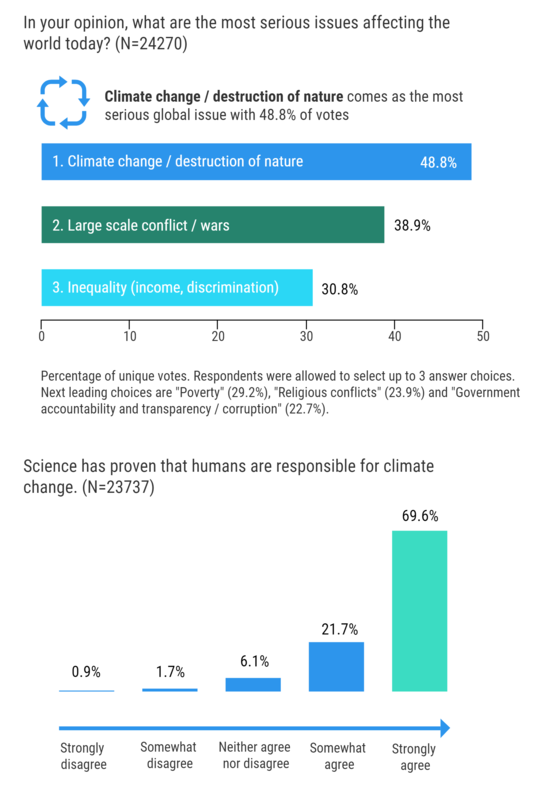 A new and related insight this year is that 91% of respondents agree or strongly agree that science has proven that humans are responsible for climate change. The other issues that make up the top three global issues according to young people are: Large-Scale Conflicts/Wars in second place, and Inequality in third place. 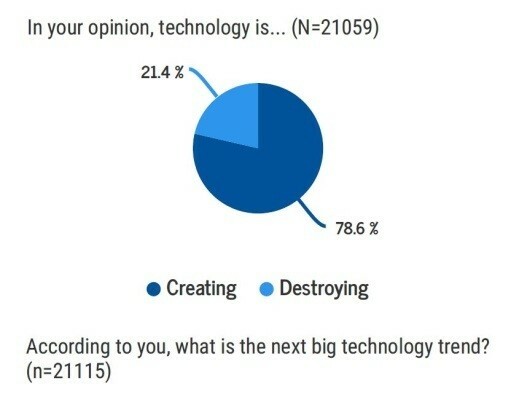 79% of young respondents say that technology is creating jobs rather than destroying jobs. This is consistent with the 2016 results, albeit with a much larger sample in 2017. And this result remains strong across regions and income levels of countries. Artificial intelligence is voted as the “next big technology trend”. And the top three sectors that could benefit from technology disruption are: education (20%), health (15%) and manufacturing (14%). However the results show that young people’s enthusiasm for technology has limits: 44% rejected the idea of having an implant in their skin to increase their capabilities. When asked if they would trust decisions made by a robot on their behalf, 51% of young respondents disagreed or strongly disagreed. 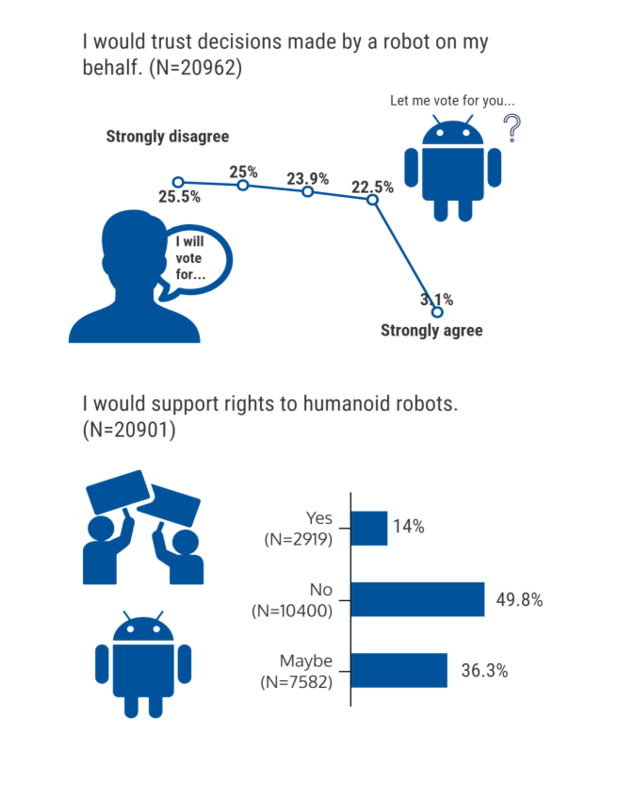 When asked about whether they would support rights for humanoid robots, the most popular response was “No” (50%). The “Yes” answer choice had only 14%, while 36% chose “Maybe”. When looking across sub-regions, respondents were still opposed to the idea, except in North America where 44% chose “Maybe”, just ahead of “No” (41%). Regionally, the strongest opposition comes from sub-Saharan Africa, with 59.0% answering “No”. More than half (56%) of millennials believe that young people’s views are ignored before important decisions are taken in their country. Young respondents voted that the top three ways to empower young people in a society are through entrepreneurship/start-ups, access to the internet and free media/social media. A large majority of young people are willing to live outside their country of residence in order to find a job or advance their career (81%). For the third year in a row, the United States remains the top choice for all young people willing to advance their career abroad, followed by Canada (12%), United Kingdom (10%), Germany (8%) and Australia (5%). However, not all millennials feel the same. While the leading response was “Yes” to move across all regions, more than a third of respondents from sub-Saharan Africa would not be willing to move (37%), far more than in any other region, and Eurasia also had a large number of respondents who answered “No” (25%). 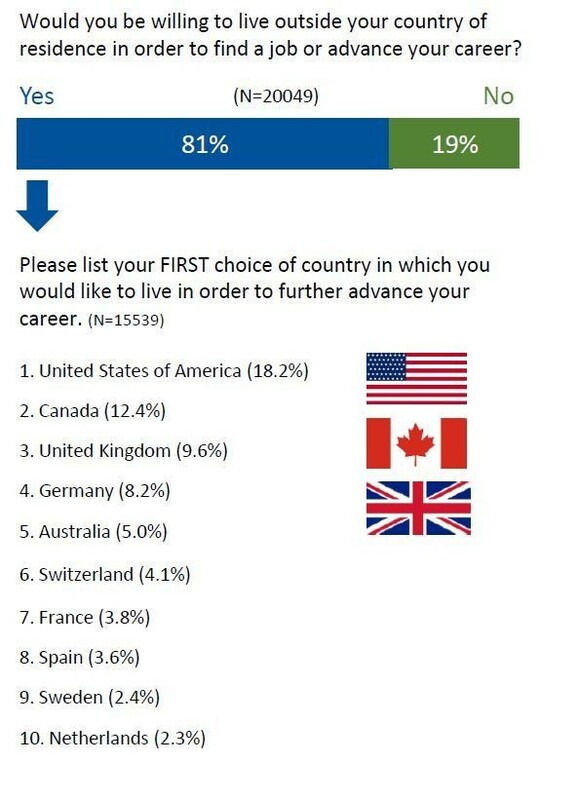 It is worth noting that just over a fifth of millennials from North America also said they would not be willing to live outside their country to find a job or advance their career. On Methodology: The Global Shapers Annual Survey 2017 received over 31,000 responses from over 186 countries and territories of which 24,766 are considered complete and included in the final analysis. The survey was open from 31 March 2017 to 30 June 2017. The final sample includes respondents who are members of the Global Shapers Community (2,092) and young people who are not members of the community (24,674). The Annual Survey 2017 is produced by the Global Shapers Community. The Global Shapers Community is a network of Hubs developed and led by young people who are exceptional in their potential, their achievements and their drive to make a contribution to their communities. It is an initiative of the World Economic Forum.